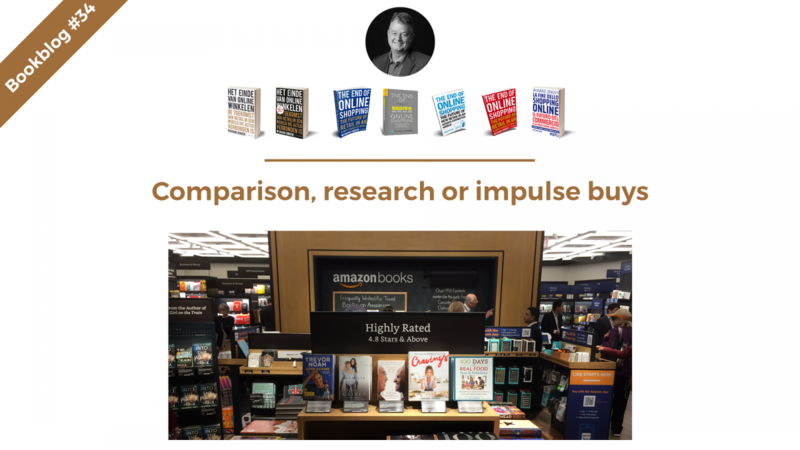 Selection is all about how and what we decide to buy, be that by rote, comparison, research or impulse. When we buy routine items – food for instance – we don’t like spending time on deciding or comparing items. Other goods and services are worth a little more effort. Comparison shopping works for clothes, shoes, coffee makers, washing machines or a TV. Just to compare some options before we decide to buy. For this, retail guru Paco Underhill coined the phrase ‘see me, feel me, touch me, buy me’. Onlife consumers take this to the next level, comparing goods and services online based on colour, size, brand, price, delivery options, and checking to see if the webstore is trustworthy based on a certificate or trustmark, not to mention the reviews of other customers. Travel, banking and insurance are other fields that have been deeply affected by online comparison shopping. Besides the shift from laptop to smartphone, we now effortlessly go back and forth between ‘home’ and ‘instore’. Already, between a quarter and a half of consumers do an instore price-comparison on their smartphone. In the future, this will be second nature to onlife consumers, wherever and whenever they buy. Amazon may try to stop them, though – the tech giant has received a patent to block shoppers comparing prices on a competitors website when they are in an Amazon store. Looking around and choosing instore before buying online is called showrooming, with the reverse being known as webrooming. Onlife consumers are just as happy comparing online and then going to the store to buy. Bricks-and-clicks retailers in the know can make this part of their multi-channel strategy, encouraging customers to use both. On retail platforms, the one-click buy is the new normal. Chinese platform Tencent/WeChat has over 1 billion consumers using the app to buy and pay for items instantly. More complicated goods and services call for extensive online research. Consumers like to collect all the relevant information from the manufacturer, and peruse reviews and ratings. The latter is known as user-generated content, which is fast becoming more important than ever. Onlife consumers love this content, for the very reason that it gives credibility to goods and services. It is also hard to manipulate – any retailer trying to do so will instantly lose face. The monopoly of information for traditional stores, banks and travel agents is firmly in the past. Manufacturers and brands are already building their own relationships with onlife consumers, which will soon translate into direct sales without needing a go-between. No one is immune to an impulse buy – all those seductive stimuli swirling around the onlife consumer can be hard to resist. Responsive sites, shopping apps, smart carts, can all offer personalized features. Perfect for retailers who want to entice onlife shoppers to do some impulse buying. Here, tech works for the retailer and the onlife consumer at the same time! This is blog 34, based on my book ‘The end of online shopping. The future of retail in an always connected world’, published by Business Contact (Dutch/Flemish editions), Nubiz (English edition for UK and US, and Danish editions), WSCP Singapore (English edition for SE Asia), Post & Telecom Publishers Beijing (Chinese edition), Hoepli (Italian edition). The book will be published in Korean in December 2018 and is being translated in German, to be published in spring 2019. Additional translations are in preparation for 2019.